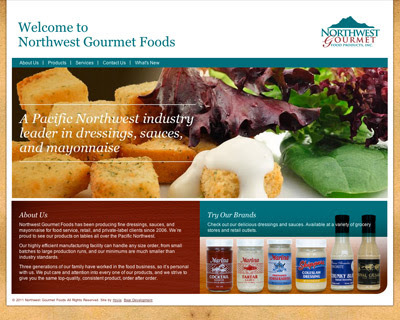 Design Hovie Studios has designed the new site for Northwest Gourmet Foods. Northwest Gourmet Foods is a Pacific Northwest industry leader in dressings, sauces, and mayonnaise. The site was designed in Seattle by designer Maxwell Churchill under the creative direction of Hovie Hawk. The site was developed by Bear Group of Seattle.